Hello there!!! This is my first post as a new member of the Quietfire Design Team! I have received such a warm welcome and am thrilled to be here. As I am sure you all are, I am wild about Quietfire Designs. The stamps, the digital files….I could go on. Here is a bit about me… I live in Western Montana, a stones throw from the Idaho border, I have a super husband, four children (we have a blended family), one boy, 20 and three girls, 17, 11 and 10. We have four Labradors and 7 chickens. My husband and I both own our own businesses and I am currently obsessed with knitting and crochet. I must do it everyday to live, haha!! In addition to designing for Quietfire Designs, I also am a Design Team member for Dreamweaver Stencils. We have a wonderful piece of paradise. Here is a photo taken from my back porch! There you have it!! Now onto the important stuff!! 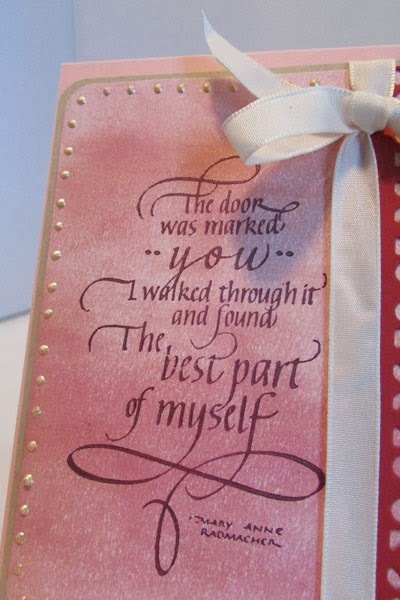 Today I created with one of the latest and greatest, The Door Was Marked "You". 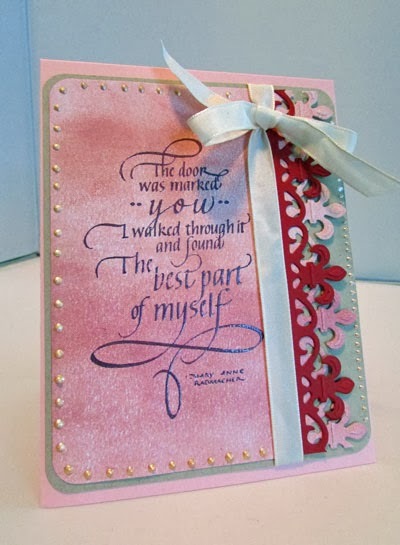 The sentiment was stamped on a background that I made by mixing three Versa Magic Chalk Inks, Pink Petunia, Perfect Plumeria and Malted Mauve. I added the colors to a craft sheet and applied with a brayer to white card stock. The sentiment was stamped with Pearlescent Crimson Brilliance pigment ink and heat embossed with detail clear embossing powder. 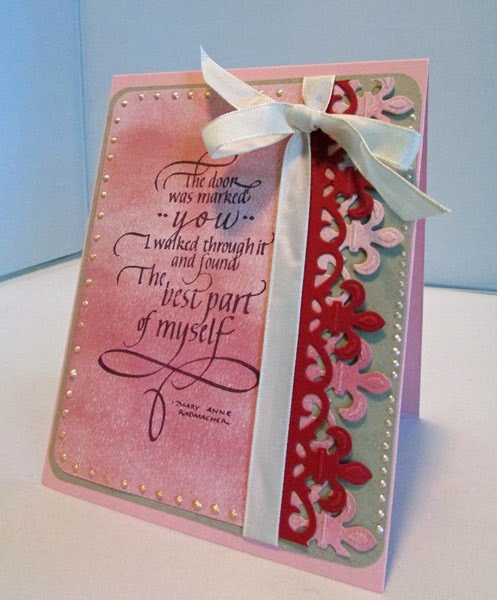 Spellbinders dies are one of the best products to compliment Quietfire Designs amazing stamps. You don't have to look far to find a combo of the two products that are perfect for each other. For my card, I cut the Spellbinders Fleur Di Lis Doily Accents border die. I cut two of them and slightly shifted to over lap each other. Pearl Accents from Ranger top off the femininity of this card. As I wrote this the last sentence, I just realized that this a sentiment I would use on a card that I would give my husband, but I can't give him a pink card. I will have to make another with masculine colors. Watch for it on my blog. Thank you for taking the time to read my inaugural post!! What a beautiful view you have! This is also a very beautiful card!